However, even Western analysts question the significance of such tactics, admitting that the Islamic State’s leadership, or the leadership of any particularly large terrorist organisation for that matter, is easily replaced and has little impact on any given group’s fighting capacity or global menace. 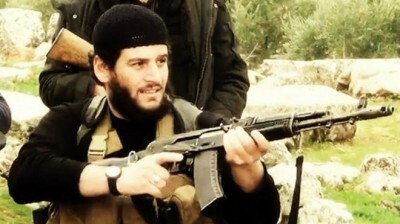 “When the leaders of terrorist groups are killed, the group tends to become more radical. A group in the immediate aftermath of leadership loss is more likely to direct its violence against civilian targets,” says Max Abrahms, professor of political science at Northeastern University and member of the Council on Foreign Relations. What Western analysts and the Western media have not mentioned, is anything regarding the lack of concerted efforts to attack the actual source of the Islamic State’s power, influence and fighting capacity, namely its funding, supply lines and state sponsors. Really Defeating an Enemy, Or Pretending? Great wars are rarely won by simply killing the leadership of any particular army or nation. During World War II, the death of Nazi Germany’s leader Adolph Hitler occurred long after Germany itself as a nation and as a military force was for all intents and purposes defeated on the battlefield. Italian leader Benito Mussolini presided over a militarily dysfunctional state even from the onset of war. In Japan, the Emperor and many senior military leaders were still alive and well upon the conclusion of fighting, but were missing anything resembling the industrial and military capacity required to continue waging war, even before the United States unleashed two atomic bombs on mainland Japan. Victory over the Axis powers came instead through systematic, crippling attacks on national infrastructure, supply lines and economic power. Without the ability to replace ships, tanks and aircraft, the Axis powers were slowly strangled before ultimately their fighting capacity collapsed altogether. In hindsight, considering the systematic campaigns targeting the Axis’ vulnerable economic and industrial bases coupled with the invulnerable and immense economic and industrial capacity of the United States and the Soviet Union, the Axis lost the war before it even started. And World War II is not the first and only war where strategy and victory hinged on identifying and targeting the source of an enemy’s power. It is a central and enduring maxim in warfare. And because of this, the West’s strategy versus the Islamic State is particularly confounding, or perhaps, telling. Fighting the Islamic State in Iraq and Syria, at the very furthest extent of the organisation’s logistical, political, financial and military reach, rather than identifying and striking at their sources appears to be an intentional effort to perpetuate the “war on terror” indefinitely. In stark contrast, Syria has struggled since 2011 to control its borders where the vast majority of the Islamic State’s men and materiel are crossing over into Syrian territory. 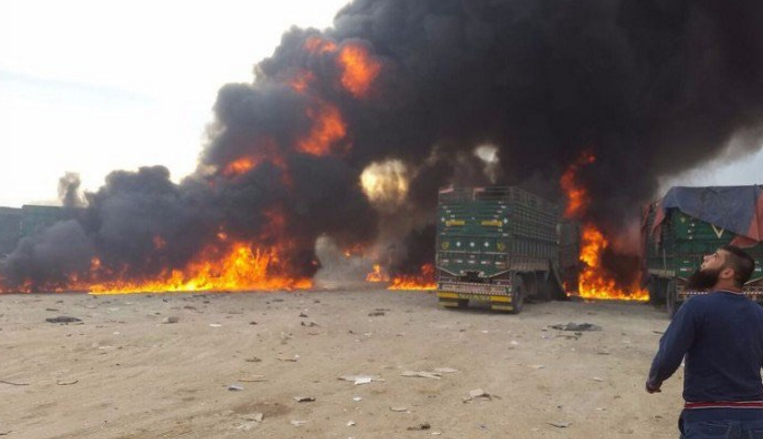 Russia, since its involvement in the conflict, has also heavily focused on Syria’s borders, attacking convoys of trucks crossing over from Turkey, resupplying and reinforcing terrorist organisations in Syria including the Islamic State. These efforts are, in fact, precisely why as the BBC has pointed out that the Islamic State is facing significant “reverses” on the battlefield. One must also consider the fact that one of the largest state sponsors of terrorism on the planet, Saudi Arabia, counts the US as its oldest and closest ally. Saudi Arabia is quite literally the prototype upon which the Islamic State was based, and a creation of Saudi and US geopolitical ambitions according to the US’ own Defense Intelligence Agency (DIA). 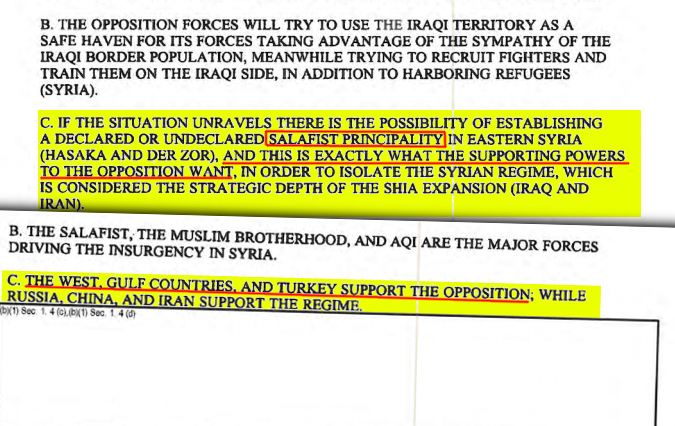 Thus, the US has admitted itself to seeking the creation of a “Salafist [Islamic] principality [State]” in eastern Syria, precisely where the Islamic State now resides. Striking at the Islamic State’s leadership is perhaps the very least the United States can do without doing nothing at all. Alleged “leaders” operating out in the field can be easily replaced through the same pipeline of men and materiel that has snaked through the Persian Gulf States, Turkey and Jordan and into Syria since at least as early as 2011. This pipeline includes training not only for Islamic State militants, but also for its leadership, just like any army. The only way to truly defeat the Islamic State is to find the source of these various pipelines, expose them and eliminate them just as the Allies did to the Axis’ industrial and economic bases to win the war. The only logical conclusion one can draw from a US-led coalition that refuses to do this in regards to the Islamic State is that the coalition has no honest intention of truly fighting and defeating the terrorist organisation to begin with and is merely cynically using its presence in Iraq and Syria to justify and otherwise unjustifiable, permanent presence of Western military forces in and around the region.